Kiley Fitzgerald has gone from school plays on the stage of the old St. Mark’s School to Chicago’s Second City theater and around the Caribbean as comedic cruise entertainment. A new performance brings Fitzgerald back home to Boston, and though the theater may be in the North End, Fitzgerald’s stories and memories are plucked straight from her time growing up in Dorchester. Fitzgerald stars in “I Am My Mother’s Daughter,” her new one-woman show centered around her youth and family’s experience in the neighborhood. “I’m a pretty average, ordinary person. But my family… is just super colorful,” Fitzgerald told the Reporter last week after a 10 p.m. performance at ImprovBoston’s Hanover Street theater. 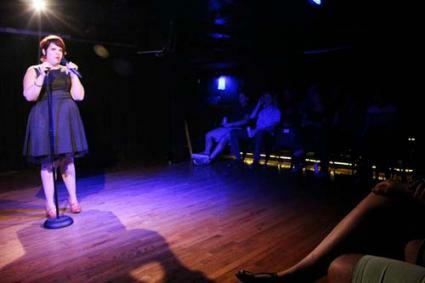 An alumna of the ImprovBoston group, Fitzgerald teaches acting and improv when not performing herself. Locals may get a kick out of the new show, which features Fitzgerald’s dead-on impression of her working class peers from the neighborhood. “People from Dorchester love hearing stuff about where they’re from because they don’t often hear it in a positive light ever,” Fitzgerald said. The actress admits that few Dorchester people come out regularly to the ImprovBoston, but that the family-based humor is universal. Still, there are plenty of inside jokes to be found by those with experience in the neighborhood. “If you know that phrase ‘what parish are you from?’ They love that. And I just wish I had more to say about Dorchester in general because I have a very different opinion of it than a lot of other people. I see it as a pretty great place to have grown up - just gangs of kids rolling through the streets playing kickball all the time,” Fitzgerald said. Fitzgerald said the inspiration for the autobiographical show comes from the reactions she’s received when telling stories about her youth. “I would just do this impression of my mother and that impression just seems to be the thing to be the thing that people really want to see and when I’m hanging out [at the theater] after hours talking. They can’t believe the stories,” she said. Tales about her mother’s boyfriends, grandmother’s eccentricities and her step-father’s reputation for drinking all make it into “I Am My Mother’s Daughter.” Fitzgerald said she only excluded the name of one of her mother’s boyfriends from the script, and that the show is otherwise all out there. Fitzgerald sees being raised by a single mother in working-class Dorchester neighborhoods as a positive. Much of the softer side of her show, beyond the strong language and elaborate stories, focuses on her mother’s struggle to raise her children right.